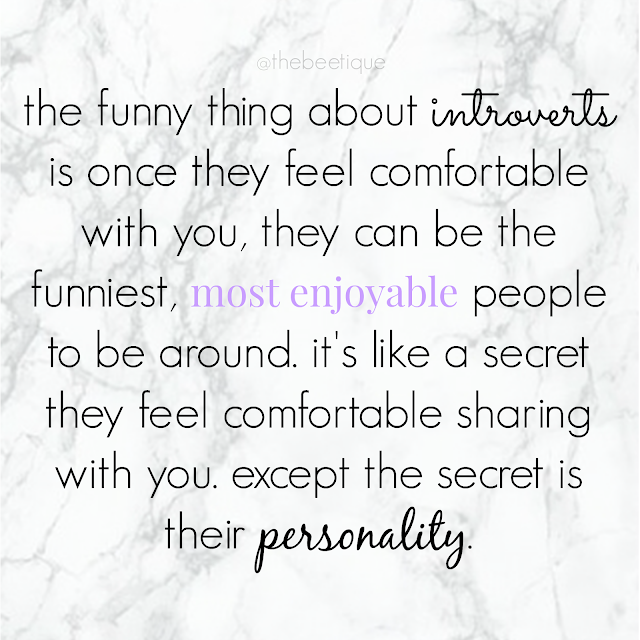 It was only until recently that I accidentally stumbled upon the difference between introverts and extroverts. In fact, I didn't even know this was an existing spectrum. Once I did, I couldn't help but be pleasantly surprised - I'm totally an introvert. And guess what? If you are too, it's all good. I had always tried to mask it, without even knowing what "it" was. Now, it all makes sense. Introversion doesn't mean being shy, self-centered, or even worse - "antisocial". In fact, some of the most successful people on earth have classified themselves as introverts! CC: Abraham Lincoln, Albert Einstein, Audrey Hepburn, Bill Gates, Clint Eastwood, Diane Sawyer, Gandhi, Rosa Parks. HYFR. Introverts are commonly seen as loners, withdrawn, and unfriendly people who lack social skill. Don't judge a book by it's cover - have you ever spoke to an introvert before? You'll notice how quickly they'll open up to you. Introverts have some of the most interesting and influential stories you'll ever hear, and most importantly, they're amazing listeners. Introverts usually appear calm because they actually enjoy alone time. Not because they don't want to socially interact, but because they spend a lot of time thinking. They think before they speak, act, and engage. They love an extravagant event [once in awhile], but they'll need a lot of time to themselves afterwards to recharge. Have you ever been sooo hungover that it legitimately takes three days of alone time to recuperate? Yeah, same! Introversion is absolutely NOT a personality disorder, and neither is extroversion. The difference between the two is quite simple, and after reading #GIRLBOSS, Sophia Amoruso (2014) said it best: “Introverts are naturally more sensitive because they don’t need a ton of dopamine, the ‘feel good’ neurotransmitter that your brain produces in response to positive stimuli. 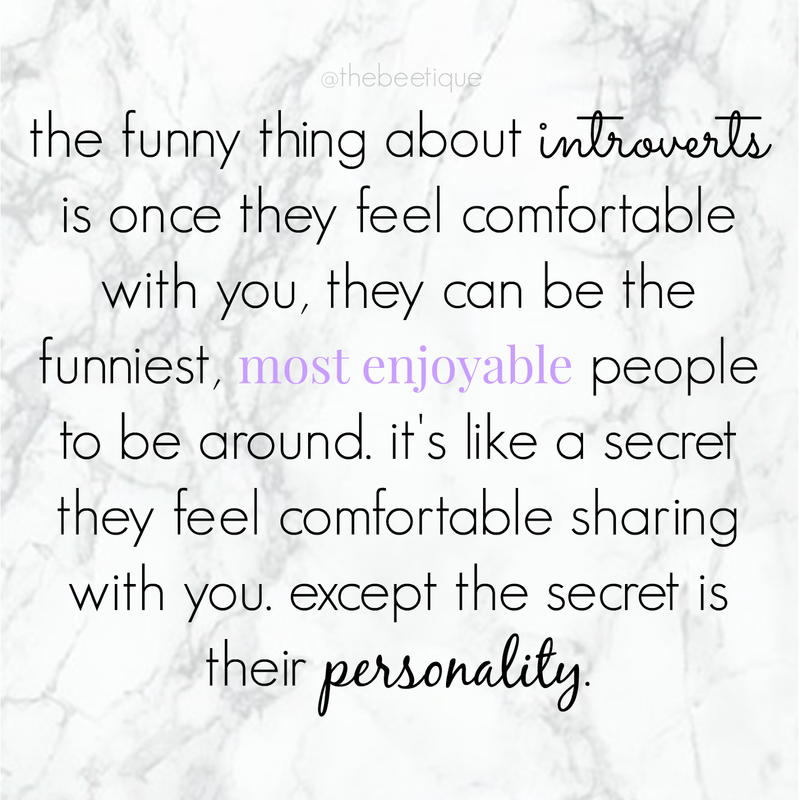 Conversely, extroverts can’t get enough. They even love adrenaline, the chemical that your brain produces in the face of fear, so they need bigger and riskier situations to produce the same natural high that an introvert gets from just having a conversation with a close friend” (p. 135). PS - you can read my Beetique Critique on #GIRLBOSS here. I'm excited to share the words in the photo above to spread awareness about introversion and let others know they're not alone. As an introvert, I started my own blog, The Beetique, because I typically have great ideas - but I tend to be quiet about them. Instead, my goal is to share them with you! Expressing myself via writing is the most therapeutic thing on earth to me, and I've found that being engaged on social media is a valuable tool for introverts to communicate. If you've just diagnosed yourself, or someone you know, as an introvert based on this post, hiiiii! You're probably thinking, wow, so that's what this is.... I thought there was something wrong with me/him/her. Hell no! You are awesome, so take your introversion + go rule the world with it. And for the extroverts reading this, you rock too. Never judge an introvert by the name. If you don't have a deep relationship with an introvert already, definitely do so. They'll show you their point of view on things that you've never once thought of in your entire life! 1 comment on "● Being Beautifully Introverted ●"